“I had a strong interest in the mathematical subjects when I was young.” This is how SPHIS alumnus Chathura Siriwardhana, PhD, describes how his career path began. Today, he is an Assistant Professor in the Department of Complementary & Integrative Medicine at the University of Hawaii where he teaches graduate-level courses and consults on biomedical research projects. 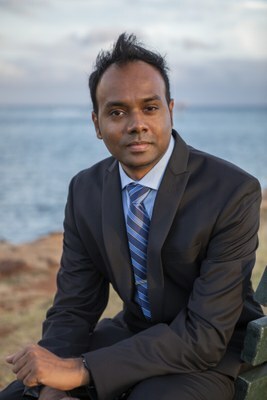 Chathura has published several articles and his methodological research topics extend to several areas in statistics/biostatistics including Personalized Treatment Selection, Survival Analysis, Nonparametric/Semiparametric Modeling, and Statistics in Genomics. Detailed descriptions of his projects are available at the end of this article. Chathura’s interest in math remained steadfast throughout his education. He has a bachelor’s degree in statistics and a master’s in applied statistics from the University of Peredeniya in Sri Lanka. During his graduate studies, he explored different areas of statistics and realized the importance of statistics in the field of biomedical research. When he decided to pursue a doctoral degree, and was searching online for biostatistics programs in the United States, he came across the SPHIS website. He researched the faculty and after hearing helpful details from several international students who had studied at UofL and SPHIS, he decided to apply. He said he was fortunate to receive a graduate research assistantship from the Department of Bioinformatics and Biostatistics to fund his studies. While at SPHIS, he assisted in organizing two professional conferences: 2013 Southern Regional Council on Statistics in Tennessee and the 2014 International Statistical Conference in Colombo, Sri Lanka. He also volunteered as a teaching assistant for two masters-level biostatistics courses to gain experience in graduate-level instruction. Chathura said, “These experiences gave me the perspective of the biostatistician even before starting my professional career.” Additionally, he worked with department faculty to provide statistical consultation for healthcare researchers. Through these opportunities, Chathura gained valuable experience in data mining using large health insurance databases. He joined the University of Hawaii as a biostatistician soon after graduating with his PhD in Biostatistics in 2016. Now, Chathura is an Assistant Professor in the John A. Burns School of Medicine. In addition to graduate-level teaching, he provides statistical consultation and analytical support for grant proposals and ongoing research. In this role, based on collaborative research in biomedical science, he meets daily with researchers and clinicians to help solve their quantitative problems. He encourages new public health students to study the “interrelations and dependencies among public health, epidemiology, biostatistics, and computing fields.” According to Chathura, a student’s willingness to explore these subject areas throughout their public health journey will make a strong platform for their future career. If you wish to connect with Chathura, you can connect with him on LinkedIn or reach out via email. In an article published in 2017 (a), we proposed a new method that can be used to select the best treatment from a K number of treatment options (K>=2). Currently, there are only a few articles discuss this problem. To select the optimal treatment, we compare quantities that are suitable approximations to true conditional probabilities of outcome variable of each treatment dominating other treatments given patient-specific scores constructed from covariates. This allows one to compare treatments for a wide variety of distributions of outcome measures. In our approach, scores are defined via a set of Single-Index Models (SIMs) or Partially Linear Single Index Models (PLSIMs). The method we propose is general where the above SIMs (PLSIMs) used to obtain scores can be quantile regression models rather than mean regression models, thus allowing a broad class of structures to get a suitable score. At the same time, this method can incorporate a large number of covariates, has relatively minimal computational efforts and, unlike existing methods in the literature, straightforward to implement. We showed that the proposed method has desirable large sample properties high accuracy in the treatment selection. In another article published in 2017 (b), we presented a novel method for estimating the state occupation probabilities, given a set of baseline covariate, which is an important problem in survival analysis and time to event multistate data. We introduced an inverse censoring probability re-weighted semi-parametric single index model-based approach to estimate conditional state occupation probabilities of a given individual in a multistate model under right-censoring. We showed that the proposed technique has desirable finite sample performances and its performance is competitive when compared with several other existing approaches. We provided two different real data illustrations using the proposed concept: (i). leukemia patients undergoing bone marrow transplant with various state transitions, and (ii). spinal cord injured patients undergoing a rehabilitation program. I currently work on few projects relating to the personalized medicine concept. In fact, I will be also organizing a topic-contributed session on Personalized Treatment Selection at the 2018 Joint Statistical Meeting-American Statistical Association in Vancouver, Canada. Collaboratively with bioinformatics core at the University of Hawaii, I am working on biomarker identification problems in cancer. For example, we recently explored microRNA biomarkers in lung cancer adenocarcinoma to develop a microRNA prognostic signature.